These citizens wanted better bike lanes. So they built them. Anonymous San Francisco citizens installing unofficial bike safety posts on 7th St.
It’s a sunny Friday afternoon. Three guys riding bicycles meet on a corner in downtown San Francisco, where they disguise themselves as city employees. Sort of. One of the men — who likes to use the alias “Cone Guy” — pulls a pair of yellow safety vests out of a bag on the back of his bike. There aren’t enough vests go around. “It's really just for the presumed legitimacy,” says Cone Guy, pulling the vest over his striped v-neck tee shirt. If it wasn’t obvious already, Cone Guy and the other two bikers don’t work for the SFMTA, the city’s Municipal Transportation Agency. Instead, they’re anonymous members of a vigilante group: The San Francisco Municipal Transformation Agency (SFMTrA for short). They commit illegal acts of infrastructure. Today, the SFMTrA is installing what they call “soft hit posts.” Those are the white plastic sticks that appear at the edge of some bike lanes. The safety posts are flexible, allowing emergency vehicles to drive over them. 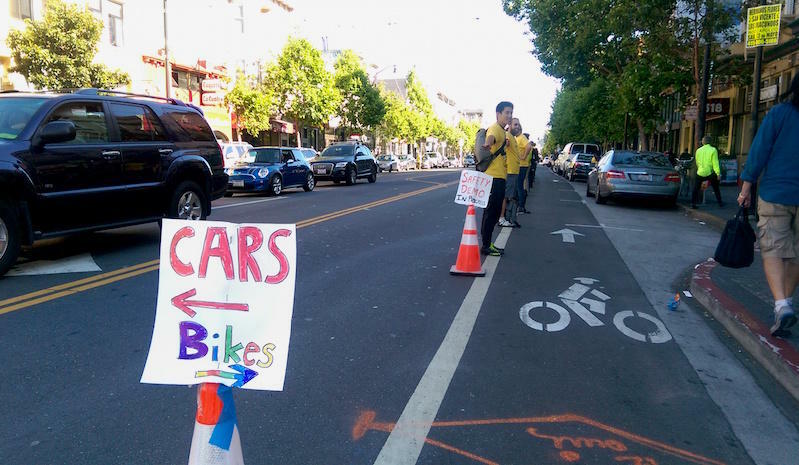 But they discourage cars from using bike lanes as a loading zone, a problem that activists say has gotten worse as Uber has become more popular. Of San Francisco’s 121 miles of dedicated bike lanes, the city has built safety posts on nine miles of roadway, according to SFTMA spokesperson Ben Jose. He says the city can only plant posts where they won’t block parking. But in many cases — like today’s — the SFMTrA believes they can add safety posts without getting in the way of cars. Without the sticker, the unofficial safety posts would be hard to tell from official ones. We’re on 7th Street between Folsom and Howard, where the city recently moved the parking zone away from the curb and into the street in order to protect the bike lane from traffic. But the city didn’t include safety posts to separate the parking spots and the bike lane — a situation the SFMTrA seeks to remedy. The three guys hold a quick planning session. They decide to place their posts at the corner of the parking spots to avoid blocking car doors or obstructing wheelchair access. Each post takes only a couple minutes to install. First, they apply an industrial-grade sticky pad to the street. Next, they press a black base on top, stomp it into place, and attach a white plastic post using plastic pins. Then they add stickers with the @SMTrA twitter handle, or the hashtag #DemandMore, which is used by bike safety advocates across the US and Canada. 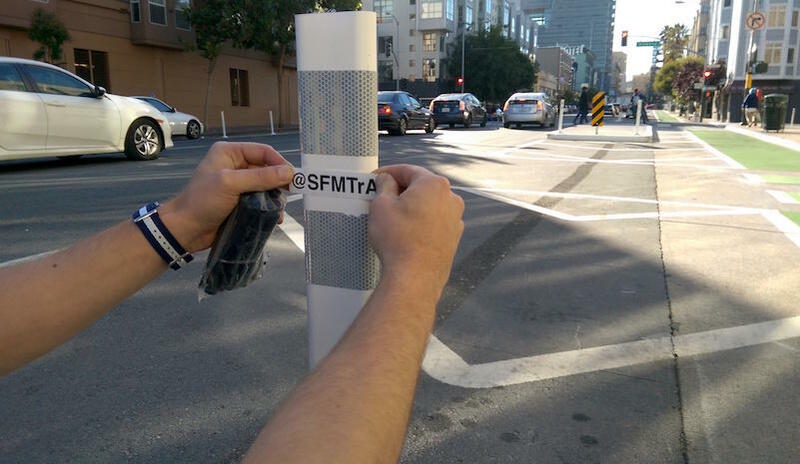 The stickers are “so that people know that they're ours,” says an SFMTrA member who goes by the moniker “Brooks.” Otherwise, only an expert could tell the posts weren’t installed by the city. A couple of weeks later, the unauthorized posts on 7th Street were still standing. The SFMTA’s Ben Jose says that the department chose not to install posts here because of potential accessibility issues. But now that the unofficial posts are there, the SFMTA will observe whether they work. "We're open to improving on [the installation] if we see that it's working," says Jose. "If we did decide to replace or upgrade, we would put in our own posts." This wouldn’t be the first time an SFMTrA addition became permanent. Previously, the city installed safety posts in Golden Gate Park and downtown on Folsom Street, after SFMTrA members put illicit posts there first. SFMTrA began a year ago as a reaction to tragedy. On June 22, 2016, two bicyclists —Heather Miller and Kate Slattery — died in separate crashes in San Francisco. Bike advocates were outraged at deaths they viewed as preventable. Some wrote angry letters to city officials, demanding safer streets for bikers. For Cone Guy, the deaths indicated that “the more official avenues” of civic participation weren’t working. 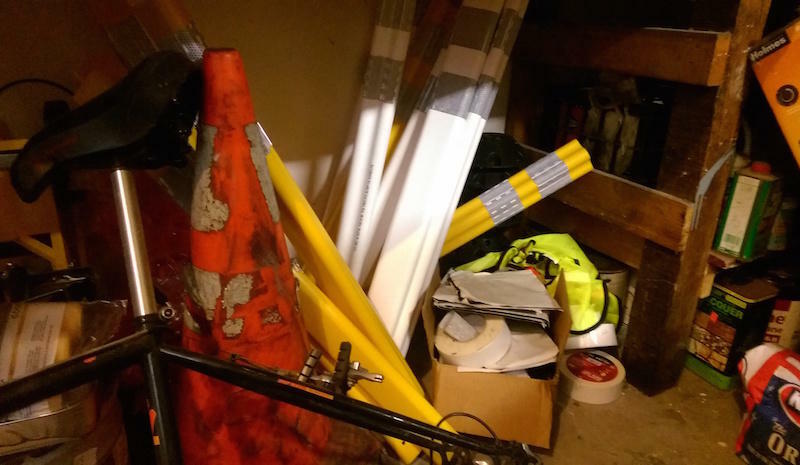 Cone Guy says he felt “helpless.” A few days later, he saw some orange cones lying on the sidewalk in his neighborhood. He grabbed the cones, and planted them on the edge of the bike lane. He took a picture, and posted it on the Twitter account of a new, shadowy organization: the San Francisco Municipal Transformation Agency. Soon, other safety activists got involved. They used white duct tape to mark off crosswalks. But mainly they drew attention to unprotected bike lanes, using lines of big orange cones. The group wanted to try something more permanent. Using money they raised online, the SFMTrA was able to buy official safety posts, from the same municipal suppliers that cities use. They went out and attached them to the pavement. They appear to be the only renegade group in the country that does this on a large scale. According to Cone Guy, the SFMTrA has raised around fourteen thousand dollars to date, from more than a hundred and fifty people. 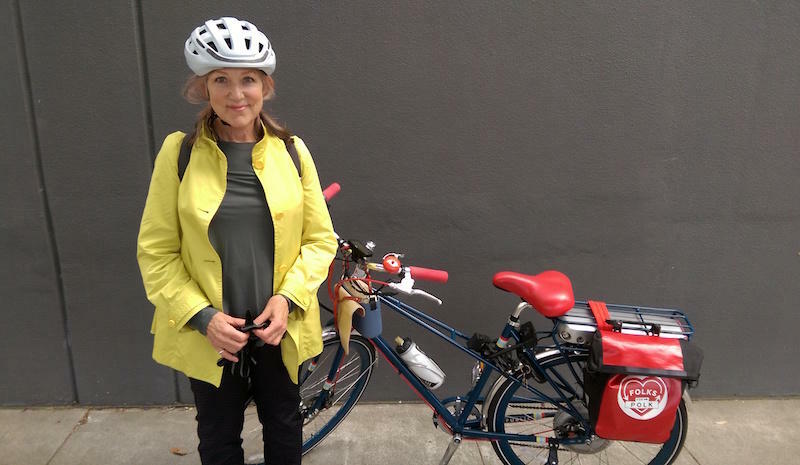 Madeleine Savit, founder of Folks for Polk, doesn't mind being identified as an SFMTrA member. "I've been called many many terrible things while being an activist. So nothing's going to get to me really.﻿"
The response from the city has been mixed. “These are very passionate folks and the statement that they're making is valid, and we’re listening to it,” says SFMTA spokesman Ben Jose. The group has helped to identify places that could use better infrastructure, says Jose. But he urges activists to use more official channels. “We certainly wouldn't want people to go around installing their own stop signs, or painting their own curbs,” says Jose. SFMTrA members say they’ve never been bothered by police while installing infrastructure, nor have they faced penalties after. However, what they do is illegal. The city typically removes their installations within a few days of discovering them, “to comply with the state's transportation laws” says Jose. He adds that illegal bike posts are a liability for the city. Savit points out that plenty of the city’s own safety posts have fallen over. She believes the city should fix those ones first, before getting rid of working posts that happen to be illegal. Jose says the city is planning 92 miles of bikeway projects over the next four years. But those projects will follow the city’s long process of design and outreach. Jose says that’s how all users of the street get a chance to weigh in — not just bikers. Savit says in practice, the city’s outreach process leads to “watered down” projects. For example, on Turk Street, plans for a protected bike lane were recently withdrawn after concerns from the fire department. Before Savit joined the SFMTrA, she spent years doing more conventional organizing. She joined committees, and founded the safe streets group Folks for Polk. She says the SFMTrA’s guerilla tactics have been more effective at getting the city’s attention. When they started a year ago, the SFMTrA was just a handful of people trying to embarrass the city on Twitter. Now, they’re a real force in city bike politics. Recently, the group has lent their support to an even more visible kind of action: human bike lanes. 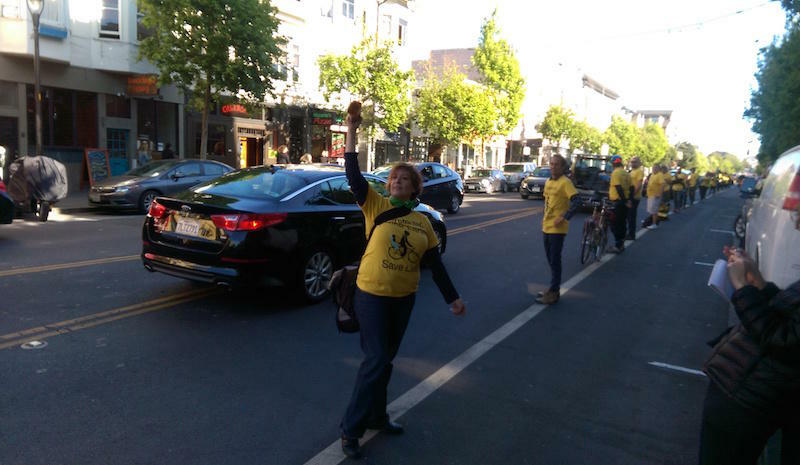 On an afternoon in May, about forty people in yellow shirts are standing on the painted edge of a bike lane like human traffic cones. They’ve chosen Valencia street in the Mission because it’s one of the city’s most dangerous streets for bikers. They’re demanding that bikers here be protected by some kind of barrier, whether parked cars or a concrete curb. Maureen Persico stands in the line ringing a cowbell and hollering out encouragement to passing bikers. Officially, this is not an SFMTrA event. But Persico asked them to help. Cone Guy is here, and the group printed the yellow t-shirts that everyone’s wearing. Some higher-ups in the city are paying attention too. After two protests on Valencia, the local San Francisco supervisors said the city should explore making this a legally protected bike lane. Getting around sprawling Santa Clara County is a trick for anyone, but for those without housing, getting to and from services and opportunities is even tougher. That’s where Good Karma Bikes comes in. On Saturdays, the volunteer and job-training cycling clinic and store does free repairs on bikes brought in by homeless folks.